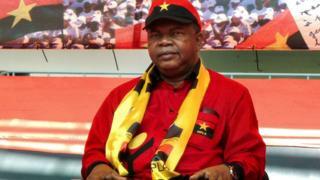 E don dey clear for Angola say di candidate of di ruling party Joao Lourenco go likely be di new president. Election commission official for di capital Luanda, say Joao party wey be di People's Movement for di Liberation of Angola (MPLA) don win over 64 percent of di ballot. Some results wey don come in from di vote, show say e go hard for other parties to catch MPLA. Lourenco, na former defence minister, and im don hit im chest say im wan make people see am as di leader wey bring "economic miracle" come Angola. Di two main opposition parties for di election, UNITA and Casa-CE, don claim say as the election commission take count di vote, say e no dey correct. Estevao Jose Kachiungu wey be UNITA representative say dem get results wey dey different from di ones wey dem announce. "E no dey possible for dis current Angola say MPLA win for all provinces with dat kain gap," im talk. Casa-CE representative Miguel Michel talk say dem no go recognise di result. According to some result wey come out, UNITA get 24 percent of di votes while Casa-CE get 8.5 percent.